I was working on a story called “Free at Last”. It was a reworking of the first story that wrote, back when I was fourteen. Then I started talking with some friends about stories that got me thinking. I went to bed and actually had a dream about a story. I got up at 2 in the morning and started writing it. The thing was, the story wasn’t a Young Adult story and Eden Winters told me I had a great YA voice. I shared the story with some friends, all of whom asked if I was going to make the story into something more than the short it was. I read through it. The characters were Taylor, Benny, and Jackson. And I started thinking about reworking the short into something more. I decided to take the boys from college back to high school. The basis of the story was the same. Taylor had a crush on Jackson who had no interest in him at all. His friend Benny was there to help him out. When I took the boys back to high school, I had to flesh out their story. Another author helped me a great deal in learning the difference between showing and telling (which I was very guilty of). Then I worked with KC Wells and she helped out even more. It was here that I found out what an amazing community I was entering into. There was no way that I was prepared for the help I was given, the encouragement I received, and the absolute love I was shown. Some of the biggest names in the m/m genre pointed me in directions, gave advice on scenarios, read and commented on my work. They were overwhelmingly supportive. Not one person had a bad comment or told me to give up (which I expected, especially since my father’s words about my writing not amounting to anything still swirl in my head). 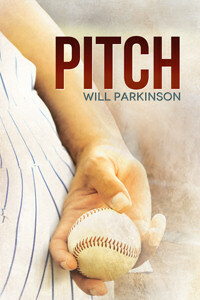 When Pitch was done, some wonderful people read it for me, told me I’d made them laugh and cry, and that they enjoyed the story enough that I should submit it to Harmony Ink (the young adult division of Dreamspinner Press). Eight weeks and two days later, I got a letter from Elizabeth North, telling me that they wanted to publish the story and that ranks as one of the happiest days of my life. Not just for the fact that I achieved a dream, but that I made so many fantastic friends along the way. What a wonderful story, Will. Thank you so much for sharing it with us. Congratulations on your release, and on finding such a fantastic group of folks. When you have the support of friends, it makes something special even grander. ^What she said^...Charlie's right and never forget, I'll always be here when ever you need someone to pester :P Looking forward to many more stories from you! !